learn the NATURAL way, by watching, listening, and repeating. All they need is a desire to learn and an environment that is rich in language use. 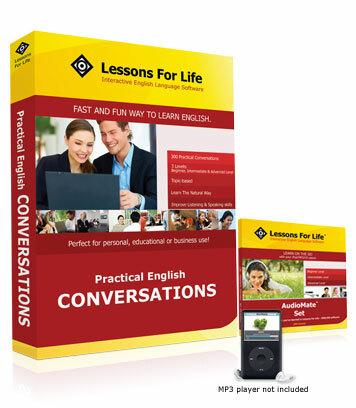 At LESSONS FOR LIFE, we use these same natural methods to help you become proficient in English. We introduce you to characters who show you how English is used in real-life situations. You'll see, hear and practise interesting conversations. You'll learn everyday vocabulary, expressions and pronunciation. By imitating native speakers, you'll learn to speak English FLUENTLY. Understanding and enthusiasm will replace confusion and fear. Once you begin to converse successfully, your confidence and enthusiasm will take over like never before and the possibilities will seem endless. Learn English on your computer and reinforce on the go with AudioMate. software, enhancing your experience anywhere you take your CD or MP3 player! Take your learning on the go AudioMate whenever and wherever you want. learning while you travel, at the gym, or just on the go. and conversations at different speeds. Play AudioMate on your iPod/MP3/CD player or on your computer.